For the ones who are interested on how I work, here is a step by step of how I've done my last illustration. I always use photoshop CS3 and a Cintiq 21UX. I can't tell you exactly wich brush I use, it's just a random one I time to time change in the Shape window (it's always better when you try to find your own brush you really like). Because of my poor skills in english, I'll explain only the important parts, you'll find more details the layers (I use a french Photoshop and name my layers in french too, sorry guys). 1. I start with the rough drawing, no need to do it too very precise. 2. 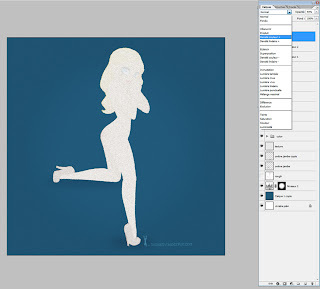 I start with the skin (here I use two different layers, one for the back arm and one for the rest). 3. Then I add layers for the shadows. 4. Then shoes and hair (different layers again). 5. Then I make a new folder for the face and I make every detail on a different layer (it's easier if you have to change something). 6. I had highlights and shadows on the hair and shoes. 7. I make the last details and correct few things. 8. I make selections to had halos and shadows on the skin. At this stage, I spend a lot of time playing with the layer modes and oppacity to find the perfect match. 9. 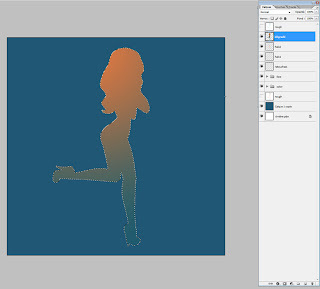 I use the gradiant tool to make a subtle color effect. 10. And once again I look for the best mode and oppacity to have the best effect. 11. I select the "light" areas and put a little bit of light in it with the levels. 12. I do the same with the shadows. 13. I make a subtle highlight on the background. 15. I add noise on a new white layer for the background, and the I play with the mode and oppacity. 16. Then I do the same just for the girl, to have the perfect amount of noise on the image. I hope it's clear enough, don't hesitate to ask questions.